"This crash was different. There was no wreckage, no bodies, and no noise." "I was looking for anything that said tail, wing, plane, metal. There was nothing." "I was amazed because it did not, in any way, shape, or form, look like a plane crash." 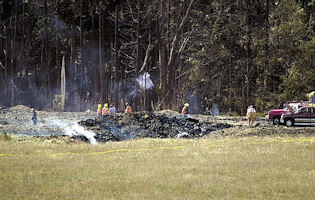 Many people who witnessed the site where United Airlines Flight 93 is supposed to have gone down on September 11, 2001, have said how little it resembled what they expected the scene of a plane crash to look like. According to official accounts, Flight 93, the fourth plane to be hijacked on September 11, crashed in a field in Pennsylvania after its courageous passengers and crew members attempted to retake control of their plane. However, numerous individuals who spent time at the supposed crash site have described seeing almost nothing resembling wreckage from a plane there. Some witnesses have recalled seeing little or no human remains at the site. And although Flight 93 was reportedly "heavily laden with jet fuel" when it crashed, investigators found no contamination from jet fuel in the soil and ground water around the site. There is a lot of suspicious evidence relating to the crash of Flight 93, which casts serious doubt on the official account of what happened. This evidence suggests that what witnesses saw might actually have been the result of an attempt to fake the scene of a plane crash in an appalling act of deception, rather than the site of a genuine crash. The relatively small amount of debris that some witnesses noticed could have been planted. If this is what happened, it would mean the fate of Flight 93 is still unknown. Somerset County Coroner Wallace Miller was mystified on Tuesday by reports out of Washington, D.C., that unidentified human remains recovered from the Flight 93 crash site had been incinerated and dumped in a landfill. "Where they would have gotten those remains, I have no idea," said Mr. Miller. "The only remains that left Somerset County were samples sent for DNA testing to the Armed Forces Institute of Pathology in Quantico, Va."
The Families of Flight 93 are equally skeptical, said spokeswoman Lisa Linden. "This is impossible to believe," she said. "The remains from the Flight 93 crash were under the care and control of ... Wallace Miller. Period." The precautionary principle is based on the fact it is impossible to prove a false claim. Failure to prove a claim does not automatically make it false, but caution is called for, especially in the case of a world-changing event like the alleged terror attacks of September 11, 2001. The Bush administration has provided no public evidence to support its claim that the terror attacks were the work of Muslim extremists or even that the aircraft that struck their respective targets on September 11 were as advertised. As I will show below, it would be a simple matter to confirm that they were - if they were. Until such proof is forthcoming, the opposite claim must be kept in mind as a precaution against rushing to judgment: the 911 hijackings were part of a black operation carried out with the cooperation of elements in our government. Let me begin by expressing my gratitude and respect for your honorable decision to turn up the heat on this evil conspiracy which has invaded our country from within our own borders. You are a very brave man, and deserve the respect of every true blooded American citizen! According to this researcher's findings, the Flight 93 that was tracked by United Airlines was a different plane than the Flight 93 that was tracked by the FAA. PELOSI: "With This Plaque, Memories of the Heroes of Flight 93 Will Remain Etched in the Walls of the U.S. Capitol"
the heroes of United Airlines Flight 93, which crashed on September 11, 2001.
of the true heroes of September 11, 2001. "Today we have created the apparatus that could allow us to engage one of those targets and, similar to, on 9-11, if we identify them soon enough and we know that they are a threat or we can determine they are a threat we have the aparatus that allows us to potentially shoot those aircraft down before they would have the effect of creating mass casualties as we saw in some other locations. In fact on 9-11 we were attempting to do that when flight 93 hit the ground in Pennsylvania as the result of some heroic efforts by the individuals on board, but we had launched airplanes, and we were chasing that aircraft down." This quote indicates that the intent was to shoot the plane down, not just intercept it. Renuart says the abiilty to intercept aircraft has been improved since 9-11. Search "victor" or other key word on the C-SPAN site to pull up the video. About half of the new entries in the History Commons' 9/11 Timeline this week deal with the actual day of 9/11. One set focus on Flight 93, on which passenger Todd Burnett reportedly said a hijacker had a gun, although the 9/11 Commission disagreed. Burnett's wife informed the FBI of her husband's calls before the plane crashed. United Airlines informed its staff of the crash at 10:17, American Airlines at 10:27, and the public at 11:17. Several major US newspapers are running headlines similar to the one in the LA Times--Bin Laden's driver knew 9/11 target, lawyer says. At first glance, this implies that he knew that bin Laden was targeting the Twin Towers before 9/11. But then a few paragraphs into the story we learn that Morris indicated at a news conference later that the eavesdropping occurred after Sept. 11, not before. Oddly, the LA Times drops the story at that point and veers into a discussion of Hamdan's arrest, leaving out a really big piece of testimony that was carried by Reuters: "If they hadn't shot down the fourth plane it would've hit the dome," Stone, a Navy officer, said in his opening remarks.